If you’re thinking about painting the exterior of your home, you are probably wondering how to best prepare your house for a new coat of paint. One of the most important steps to painting both your siding and trim is to properly prepare each surface so that the paint will adhere and last longer. Power washing – or pressure washing – is one of the most critical components of preparing your home for new exterior paint. Do You Have to Power Wash Your House Before You Paint? While you may take a look at your house exterior and think that it doesn’t need to be power washed, you will do yourself a disservice if you decide to skip this crucial step in the exterior painting process. Even if you think your house looks clean enough, it likely isn’t. When paint is applied to a home that hasn’t been cleaned thoroughly, the paint won’t stick around for very long. Not only will professional power washing ensure that dirt is removed, it will also get rid of old paint, mildew, and chalking that you may not be able to see yourself. Chalking is the old paint surface breaking down from years of sunlight exposure. If you lick your thumb, then swipe that over the paint film, odds are you will see a chalky residue on your thumb from your current paint color. If you try to paint over this chalky surface without power washing first, the paint won’t stick properly. So, yes — you should power wash your house before painting so that the new coat of paint will properly bond to your home exterior. 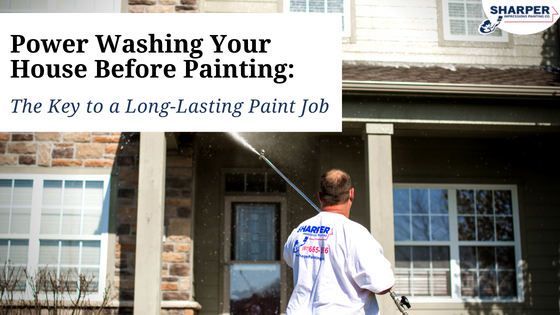 Power washing is the key to ensuring a long-lasting paint job every time. A More Powerful Clean. If you are thinking about using your own garden hose to wash your home exterior, it won’t be enough to get the job done. A pressure washer or power washer is much more powerful than a regular garden hose. In fact, power wash hoses can be up to 50 times more powerful than regular hoses. These high-pressure systems are ideal for getting a thorough clean on your house siding and preparing it for a smooth paint job. 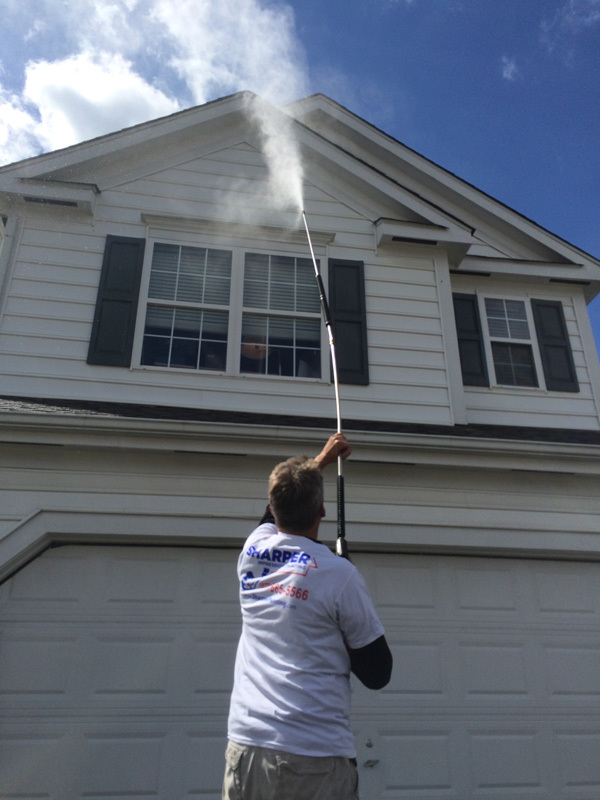 A Proper Power Wash. Professional painters are well-equipped to handle the cleaning of any type of house siding. They are experts and use the proper equipment and cleaning agents for every part of your house. Using the right power washing attachments ensures that water is applied at an even pressure on every surface. The special cleaning agents used also alleviate any worry about siding damage. When homeowners opt for DIY power washing, they typically don’t know which attachments to use. Improperly power washing your own house can cause significant damage to your siding, so it’s always best to contact professionals who are experts in their field. Loose Paint Removal. If your house has peeling, flaking or blistering paint then expect a professional pressure washing to blow off loose chips of paint. This is a good thing! Removing loose paint with power washing helps the paint preparation process. Later, your painter will then scrape and prime any bare wood areas before painting. Sufficient Drying Time. Professional painters know precisely when a house is ready to be painted after giving it a good power washing. A major cause of paint failure on home exteriors is when paint is applied before the siding has become dry enough for painting. Adequate drying times after power washing can vary depending on the type of siding you have and the manner in which it was washed. And only professionals will know when it’s the right time to add that first new coat of paint! If you’re thinking about painting your home exterior, don’t make the mistake of skipping out on a thorough power wash. Our professional painters at Sharper Impressions are fully-trained and equipped with the power washing tools, cleaning solutions, and know-how needed to power wash any home safely and ensure a long-lasting paint job. Get a free exterior painting quote today!